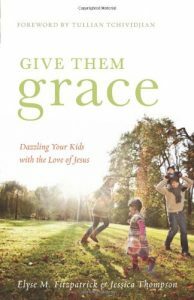 Mother and daughter authors, Elyse Fitzpatrick and Jessica Thompson make an excellent main point in Give Them Grace that truly righteous and godly children are products of their own personal relationship to God. It was good to be reminded that there really is no perfect parenting formula for raising godly children. This is a concept that ought to be obvious to anyone who is a believer. As parents (and teachers of other church kids for that matter) we ought to be going beyond just teaching facts about the Bible and about Bible stories. It is right to point out that the prodigal son’s need for redemption was the same as his self-righteous brother’s. That was the best part of the book. I disagreed with the authors’ making a distinction between social obedience (manners), civic obedience (the laws of the land), and religious obedience (personal or church-related habits and disciplines). I got the impression from the authors that it’s all right to teach manners and civic laws, but we had better be careful teaching religious disciplines because that might lead to hypocrisy. I don’t understand why it’s ok to require obedience in one area of life but not another. Overall, I liked about half of the book. Setting high standards at home or at any institution can be done with grace and in loving ways. Give them grace? Of course. Teach the obedience too. For a more in-depth review of this book, go to Rebekah’s blog at MostlySensible.com.